Lunarpages was founded in 1998 and since then has established itself to be one of the top enterprise level hosting companies in the world. They have grown their client base to over 150,000 customers by providing a wide variety of packages to suit most any client’s needs. Lunarpages is a one stop shop for all hosting options. From basic shared hosting to dedicated and managed sevice, Lunarpages encompases most every option in the web hosting industry today. Lunarpages offers 5 different shared hosting packages alone. Instead of offering one all inclusive plan, they decided to offer several different options based off the needs of each customer. The sheer number of options is a bit much to take in from the beginning, but after getting settled in to one plan things run more smoothly. Lunarpages does offer U.S. based support, however it is not 24/7 phone support like most other hosting companies. They specify specific hours on their website for when support can be reached. We imagine this would draw customers away from signing up. They do however offer a ticket system, a wiki, and a community forum as other means of support. One major positive of offering so many packages is the ability for customers to have a more customized and tailored package, one that suits their needs better. With the option to upgrade or downgrade, there is no circumstance in which a customer’s website can’t find a home with Lunarpages. They every hosting option imaginable in one place. Lunarpages offers an online control panel. Although it is not up to par with cPanel as far as ease of use or the abundance of features, it still gets the job done. It includes an array of popular web scripts available for installation for free. 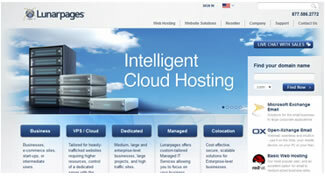 Customers will still be able to get a lot of use out of their hosting account with the online control panel.